This entry was posted in Uncategorized on February 27, 2014 by stevedalgetty1. How Much Confidence Do You Have in God? In a 2011 Gallup poll, 92% of Americans said they believed in God. While this widespread belief in God may seem remarkable given what we see in much of our pop culture, a more telling question might be how much confidence do we have in God with respect to our day-to-day actions? Do we seek his guidance for both large and small decisions? Do we tell the boss what he or she wants to hear or speak the truth? Do we correct a teenage child even though it may provoke an extreme reaction? Do we offer to pray with a co-worker who has just learned that he or she has been diagnosed with cancer? God asked Gideon to lead the Israelites against the Midianites who had been raiding their lands. Gideon believed in God, but as the footnote in the Community Christian Bible suggests, his confidence in God appeared to be a bit shaky since he asked for a sign not only once but twice. He said, “If you will save Israel by my hand as you have promised, I will place a wool fleece on the threshing floor. If there is only dew on the fleece and the ground is dry, then I will know that you will save Israel by my hand.” (Judges 6:36-37) God gave him this sign, but then Gideon wanted more assurance and asked that the reverse happen with the dew being on the ground, but not the fleece. God provided this additional assurance and then Gideon, with God’s assistance, went on to defeat Midian. 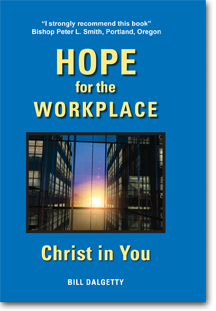 In Hope for the Workplace – Christ in You, there is the story of Dr. Sheri Donaldson, a physical therapist whose co-worker, Ashley, was scheduled for an MRI to check on a piece of brain tumor that could not be removed from a prior surgery. Every time Ashley would have an MRI to check on the status of the tumor, she would get very anxious. It just so happened that Sheri was able to see Ashley right before she was leaving for her appointment. Sheri sensed that the Lord wanted her to pray with Ashley that this time the MRI would show that the tumor was gone. While Sheri had reservations about whether she should follow what she deemed a prompting from the Holy Spirit, she nevertheless placed her hand on Ashley’s forehead and prayed in the name of Jesus that the tumor would be gone. We see in Sheri’s story someone who not only believes in God, but also has the confidence in God to step out and boldly offer to pray with her friend that God would heal her and take away all trace of the remaining piece of brain tumor. The Bible has hundreds of promises like this one. How much confidence do you have in them? This entry was posted in Uncategorized on February 20, 2014 by stevedalgetty1. But then Jesus says, “He who believes in me will live, even though he dies; and whoever lives and believes in me will never die.” (John 11:25, 26) This, of course, runs counter to what we experience in being born into this physical world, living the life we see, hear and touch. Many years ago a secretary with whom I worked was diagnosed with advanced colon cancer. Her name was Rita. She went through multiple surgeries and treatments. I watched her as she went from this vibrant woman in her prime, full of life, grace and happiness, literally shrink physically before my eyes as the cancer and treatments sapped the life from her. In visiting her a few days before she died, I was shocked at her physically deteriorated state. That evening, while reflecting on her condition, the thought came to me that while the cancer was destroying her physical body, it could not destroy her because who she was, included so much more than her physical body. Yes, her physical nature had a part in defining who she was, but the most important part of her was her personality, her gracious and loving manner, her kindness, her willingness to listen to a co-worker with a problem, her diligence in her work, her quiet peace and joy when our office was experiencing a chaotic moment, her inclination to love no matter who was standing in front of her. This entry was posted in Uncategorized on February 13, 2014 by stevedalgetty1. Are You Patient with God? We live in a fast-food, express lane world. We have instant cash machines in grocery stores, drive-through banking, one hour cleaning, jiffy lubrication for our cars and overnight delivery of mail. We seem to be in a constant rush. The virtue of patience and waiting holds little value, considered more a distraction than an attribute. In the Exodus 23, God is giving instructions to the Israelites about how he is going to help them overcome the people who occupy the land he has prepared for them. He says he is not going to drive out the occupiers in a single year. “Little by little I will drive them out before you, until you have increased enough to take possession of the land.” He explains that if he drove them out immediately, the land would become desolate and the wild animals too numerous for the Israelites to handle. God designed us to grow little by little from infancy to childhood, from childhood to puberty, from puberty to adulthood, from early adulthood to maturity. Shortening the process will not lead to the desired outcome of maturity and wisdom. How often have we seen the fame accompanying a child actress or the instant wealth accruing to a gifted collegiate athlete gone professional lead to a disastrous result? Our daughter Emily was born with Down syndrome. One of the characteristics of children with Down syndrome is that they experience delays in their development. That first step takes a little longer. First words come a little slower and physical coordination can take time, but each milestone is accompanied with much rejoicing and a sure sense of achievement. The question is can we abide by God’s timing of what he wants to accomplish through us? While we are looking for instant success, God realizes that we often need preparation to do what he has put before us. “Little by little” he prepares us, or the hearts of the people he wants us to reach, so we need to be patient with God to provide the circumstances for us to act. Several years ago, one of my daughters made a plaque with beautiful calligraphy for my den. It reads, “Be still and know that I am God.” (Psalm 46:10) I gaze on it each morning while I meet Jesus for coffee and wait on the quiet whisper of his will. This entry was posted in Uncategorized on February 6, 2014 by stevedalgetty1.